In my last post on steel windows and doors, I noted that rooms with windows on two sides (I was reflecting on the beautiful room above, which is in a French pavilion style home with wings off the back of the home) are instinctively pleasing to me. One of my readers, Terry from Architecture Tourist, commented that 'light on two sides' is in fact an architectural principle that is covered in great detail in the book 'A Pattern Language' by Christopher Alexander. 'A Pattern Language' discusses plans for building that are based on natural considerations, one of which is natural light. Alexander conducted studies and found that people feel the most comfortable in rooms that have windows on at least two different sides of the room, and find rooms like these to be more pleasant and choose them over rooms (in the same house) that have windows on only one side or no windows at all. Looking through some of my favorite images in my inspiration files, I saw image after image where there are indeed windows on two sides of the room. Quality of light in a room and a home has always been very important to me, and a room with windows on two sides naturally has a good quality of light (or at least, a fair amount of natural light) due to the fact that there are two exposures. My favorite guest room, in the home of designer Lori Tippins, has windows on two sides; the combination of the soothing color scheme and the lovely light that comes in from the north and west makes this one of my favorite rooms ever. Many of the rooms in Lori's home were consciously designed to have natural light from multiple exposures. This breakfast room, from the Atlanta Homes and Lifestyles Christmas showhouse, gets light from the south, east, and west. This space was by far my favorite from the showhouse; the windows and light certainly contributed to the light and airy feel that so captivated me. Interior design by Liz Williams. This room, from an old Atlanta real estate listing, was saved to my 'favorites' file because of the doors and windows that let so much light into the space. One of my favorite family rooms - perhaps because of all of the light that comes in from the windows and doors that are on two sides of the room. Before I saw this house in person, I did not understand how this room was able to have windows on two sides; it is actually a wing that goes out from the back of the house. Wings are a very effective way to bring in more natural light into a home, and also have the effect of defining the outdoor spaces of a home. One of my favorite rooms by Ginger Barber, via Cote de Texas. In traditional symmetrical floorplans, the living room is often in one of the front corners of the home and has the advantage of windows on two sides of the room. This family room, from an Atlanta real estate listing, is in a wing off the back of the house, and actually has windows on three sides of the room. Creating a space that has both lots of natural light as well as wallspace for furniture and vignettes is something I will certainly ask the architect of my future home to take into consideration. A beautiful room with tall doors on two sides of the room makes this space filled with light. Photo by the talented photographer Emily Followill. This master bedroom, from a home in California with interior design by Betty Burgess, has beautiful French doors off the back. I am interpreting the opening to the left of the bed to be a window, but now I am wondering whether it is a door? Image via Veranda. This bedroom (from an Atlanta real estate listing) has windows on three sides. Even the little window above the bed (with its charming shutter) gives a feeling of light, and proves that a windows does not have to be large to convey a feeling of light. This bedroom, from a Century furniture catalog, was in my 'virtual home 2008'. Although I like the general style of the room, what really appeals is the lightness of the room and the windows and doors that bring in light from two sides. This room has windows and/or doors on three sides! The design must have been challenging because of the width of the room and the multiple windows and doors. Interior design by Ingrao. This beautiful room, captured by photographer Mali Azima, is perhaps one of my favorite living rooms from an architectural perspective: tall French doors on two sides of the room are both beautiful and let in ample natural light. I would love to see what the outside of this home looks like! 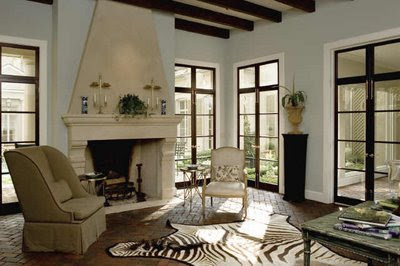 This living room, from a home by architect William Hefner, has a similar design, but uses windows on either side of the fireplace instead of doors. I also love it when a kitchen has light coming in from two sides - this is a great way to achieve the look, with a small sidelight. A small sidelight is seen in this kitchen too - the kitchen was designed by Atlanta kitchen designer Cynthia Ziegler, and was on a tour of homes in early May. A kitchen designed by Barbara Westbrook, with light on two sides of the room. This is often achieved by having few overhead cabinets, and by having the kitchen placed in the corner of the house. The 'Southern Accents Top 10 Kitchen' that I posted earlier this year is also in the corner of the house, and the kitchen has light from two sides. This is one of the prettiest kitchens I have seen in recent years. Another important thing to note from an architectural perspective is that kitchens that have light from two sides typically do not have an attached garage, or the garage is set back or even 'drive under' (this particular house has a 'drive under' garage). Drive under garages are found quite often in Atlanta, where the topography is hilly and the lots can be quite narrow in prime areas. In homes like this, the garage is at the basement level, underneath the main living area. Newer homes with this set up typically have elevators or dumbwaiters so the owners can send the groceries upstairs. Although the desirability of this set up is questionable, the big advantage is that the garage does not take up space on the main level of the home and does not block the light. Of course, creating a home that has rooms with light on two sides is easier if the home is a simple square with four rooms on each floor, but given the number of rooms that people like to have in their homes in 21st century life, this can be quite an architectural challenge. A Pattern Language addresses some ways in which this can be achieved, including wings and 'wrinkling of edges' by having additional corners. Do you find rooms with light from two sides to be more pleasing? In my own home, which is Charleston style with the door on the left side of the house, several of the rooms have light on two sides, including my entryway, living room, master bedroom, and breakfast room. Although the back of my house is north facing, these rooms get light from two different exposures and give my house a light and airy feel (the bleached oak floors help too). I would love to hear if my readers have an awareness of a preference in their own homes. Light from more than one wall in any room is incredibly appealing to me. We have this feature in several rooms in our home and the only challenge I find is that it does limit wall space for furniture and art work. That is a sacrifice I can make though because the more natural light the better! What an interesting post! I never gave much thought to the concept of light from two sides before, but I certainly will going forward. Thinking about it now, the rooms that we "live in" in our home all have windows on more than one wall. The ones with light coming from one direction only tend to get very little use. I just love when I learn to "see" something in a new way. Thank you as always for the inspiration! Great post! Thinking about each room in my house, my favorite ones are the ones with at least two sides of light. As s.w. design stated above, thanks for letting me see something in a new "light"! Your blog is so inspirational, I really enjoy it. Wonderful post! I completely agree that rooms look better with natural light flooding in from two windows as opposed to one. You always post such beautiful rooms. I especially love the one by Mali Azima. The hanging light fixture in that room is gorgeous. From the time I first read this design pattern, I began looking at interiors differently. I recognized why some rooms just feel wrong. I got the "wrong" but didn't have a clue "why." One idea in this pattern is about the amount of light - can you get too much? The second idea is the harshness of the light, particularly when the sun in shining into the window. Windows from 2 sides allow light to scatter pleasantly. I think the harshness makes a room feel wrong. A huge south facing wall of windows in a loft certainly admits plenty of light but it can be a very harsh light. A north facing window doesn't have the brightness, but because the light starts out scattered, it isn't so harsh. * Congrats on a SUPERB collection of spaces, & wonderfully informative/well-expressed writing! I have never really "thought" about windows in THAT particular aspect, but it makes so much SENSE!!! In MY mind's eye, it's always been about THE VIEW~ huuuuuge windows by which to enjoy them, great/easy/attractive access to the outdoors, plus a good amount of skylights for another dimension. I enjoyed this SOOOO much I can't thank you enough, and coincidentally (or not! ), you shared a few of my BIG-TIME FAVS here!!! Terry pointed out (maybe in an email or another comment) that often it is more pleasing to have windows or doors that are smaller scale as opposed to encompassing an entire wall. I have found that I prefer for windows and doors to be spaced on a wall - I think that is why I like the family room on King Road so much, because there are some beautiful doors and windows, but they are spaced throughout the room, and there are also placed for furniture and a fireplace. This image is gallery is truly fantastic.. I just looked through my room files and have a shocking number with windows on 2 sides (or more). I guess my brain has been registering this airy effect for a long time! Lovely post, again. How observant. So interesting & I'd never heard the principle. The reason I fell in love with our house is because of how light & airy it feels and now I realize that it's because most of the rooms have light from 2 sides!! Really interesting and just love all the images you posted. Definitely one of my favorite posts and the family room with the vaulted board ceilings is AMAZING!!!! Do you know who did it? Beautiful post and so well done. I love as much natural light as possible. I also appreciate interior window symmetry and feel like it brings harmony to a room. Fantastic post! And so very, very true (although I never realized it!) I absolutely REQUIRE good natural light in a home - gives a home Life! I have always been a fan of well organize rooms. Where the architectural details are taken in consideration and natural light is the main factor of bringing a sense of personality to a room. My bedroom has light on two sides and I do love it. It has so many different moods throughout the day. And I simply adore that last kitchen in your post! Perfection. The tones of most of these pics are what I am drawn to. Wonderful picks by you. Love the Mantle in the first and adore that kitchen and table on the last. Thanks so much for the lovely compliment on my blog post. Much appreciated. Stunning Stunning post! Where do you find these incredible images! You are so amazing! This post is going into 'my favourites' file. Thanks so much for this distinction. It's why I love my living room so much! Never too much light, I loved all the rooms you chose & actually have a few filed away for my inspiration. Over the weekend on HGTV's Ask Genevieve this couple tore down an old panelled wall & found two hidden windows, one on either side of their fireplace & insisted she keep them closed up!!! I wanted to committ this couple for psychiatric observations cause they were clearly off their rocker!!! I would have thought having so many windows and doors in a room would hamper the furniture positions. You're beautiful images show this is not necessarily the case. Like your other readers, favourite rooms of mine seem to have light from two sources. Funny how we just accept things without really giving it much thought. Thanks for opening my eyes. Yes, I LOVE rooms that have windows on two or more sides. I had no idea why, until I read your post and learned that people are naturally drawn to rooms with multiple natural light sources. Funny, I was just at the CHEO dream home yesterday, which happens to have windows on two sides in a couple of the rooms. I told my friend who was with me that I love that look :-) I also love oval & round windows, but that would be a whole other post!! Light, light light.It is so important to ones emotions! Beautiful post and images. This has been the major complaint of my new house... not one single room has windows on more than one wall. I've been saying this to my hubby for 4 years now, but he just doesn't get it. What's a girl to do! Love all your photos! Great post!! This is so interesting to me. We built our house with a production builder, so our house plan has been used a lot in our neighborhood. My major complaint about the plan was that so many of the rooms only had windows on one wall. The reasoning was that they didn't want windows looking at the neighbor's house, but I didn't care. I needed windows on more than one wall in a room, and we added several. It really does make a difference! I had no idea it was an architectural principle, but it makes sense to me. I love all the rooms. The natural light makes everything in the rooms better. The book 'A Pattern Language' is great. My wife and I used it to build a house in 97. the thing that we used to great effect was making an axis thru the house with windows and doorways lining up to increase light. One place this made a big differance was adding a second window in the bedroom at the end of the hall and lining it up with the door into the room. As you enter you can see outdoors and the light can stream in and light the hall. A bay window sometimes adds more light than just the width of the window, it breaks the flat surface of the wall and allows light from many angles. Thanks for your post I loved going back to such a great book and seeing your wonderful rooms. I have always been drawn to houses that have lots of windows , including light coming in from more than one side. Every room in my house, excluding the pantry, has light from two or three sides. For instance my kitchen has light from three sides, so as you can expect I have limited upper cabinets. It does make placement of furniture a problem and I am limited to where I can hang artwork, but my house is always so bright. In Boston in the winter daylight is short so I think it is worth the trade offs. What a wondeful topic- as always! Really enjoyed this post. I always wanted a house with more light than my last house which had many rooms with only windows on one wall. And boy did I get it! New (antique) house has all rooms with windows on two, if not three walls. Furniture placement is a challenge, and am dealing with that at the moment! Also, as Terry asked "Can you get too much light?" The answer is Yes, as I am dealing with that also in my kitchen and master bath that both have several windows on the E/W sides. I wasn't planning on doing window treatment in the kitchen as I love the big windows, but the morning sun is proving a bear and makes it hard/unpleasant to even be in there... so treatments in the works! Joan, you certainly can get too much light. I do a website for lady who does loft window treatments - many have 20 foot tall walls of south or west facing windows. It's like living in an oven. And her stuff is very expensive. East windows don't bake you like west windows, at least in Atlanta, but the sun can still fade your fabric. Most established Atlanta neighborhoods have great summer shade (and we really need it). Thank you so much for your comment on Hill Country House. Your post is so thorough. I wanted to keep my text short and to the point as I hope to feature the same house with more details of the interior someday soon. I had not thought of windows so specifically before ( I think in terms of having space for art on my walls in my own house!) - and the natural light is just one aspect of the Texas modernist design aesthetic - consideration is also given to heat(like Joan mentioned) and cooling, views, etc. Anyway, this is not about my post - it's about yours! Just lovely and inspiring for me - maybe I will try to give more information in my posting as people seem to enjoy the education and the perspective of the writer! Thanks again - I did not realize that you read my blog and I am flattered! Thanks for the comment on my blog! I love yours- especially all of your Atlanta real estate pictures! Pattern Language is on of those design Bibles. We have several copies. Steve always designs homes based on the principles discussed in this book. I loved all of the images you selected. William Hefner is a personal favorite. What a talent! What a unique concept to write about - I had never thought about it. except for a French house built enfilade style where the light comes from the front and the back of the house. The window treatments are absolutely beautiful. Each one of them are excellently draped and very practical letting a huge amount of light pass into the rooms. Love that room photographed by Mali Azima - just stunning! I believe you are on to something,when building our house, at the last minute, I added another window at the corner of my bedroom overlooking the patio. It is one of my favorite rooms and I now realize as a result of your post, it is because of the light and can't imagine liking this room as well without it. You do give up valuable wall space though, but in the end, it is worth it. A copy of that kitchen with the wingchairs and hydrangeas has gone into my "favorites" file. I can see being in that room and enjoying every minute. Windows on as many walls as possible make a home so inviting. I loved all these rooms but that last kitchen made me drool. Gorgeous! I love that kitchen designed by Cynthia ... that bank of windows above the sink is beautiful. Thanks for posting it! I love all of these rooms. Each in their own unique way. Thanks for the post. The rooms/homes you've showcased are beautiful... I love rooms with windows on at least two walls as well! Our little house is older with those small, high piano windows (not stained glass... yet!!) in 3 rooms - so while not totally like what you've shared in this post, they definitely bring a little more lightness and character to the space. Thanks for dropping by DesignTies and commenting on my current hair style :-) Still trying to accustom myself to the change! Lovely article, I'm having a love affair with white right now, so I really enjoyed your pictures. Most people simply don't understand that the best light source is still the natural lights. The two side natural light will make a lot of difference in your design. Oh my goodness, the rooms! Just beautiful but I love how you made the post so informative as well. Beautiful. Great images and I love the idea of light from two sides. It would be especially nice in an area where the sun does not shine everyday and where it''s not too hot. One might have the feeling of living in a tree house! I love this post! I have been noticing the exact same thing in photos I gravitate to. Thanks for verbalizing it all! As always your posts are wonderfully informative and love the fabulous Atlanta designer pics you highlight. I was just in Atlanta a couple of days ago with the family and made a couple of quick stops to a few select favorites... unfortunately didn't have time for the full tour, but Atlanta never disappoints! Can't wait to return! I had never thought about this before, but you're spot on - there's something inherently appealing about these rooms. My living room is a tricky shape but it does have this feature, so I shall try harder now to count my blessings! My house is a small cottage but we do have windows on two sides in every room. I just wish some of the windows were larger. One thing I like is transoms over doors and windows. Even over interior doors it helps to move the light through the house! I definitely agree -- these rooms are VERY appealing!! Natural light makes such a difference! Found you through Hooked on Houses - this is a whole different league! Thanks for the inspiration. Great pictures! Thanks so much for visiting & your comment at Back Porch Musings. This post is lovely. It explains why I love our Kitchen/Hearth Room/Family room. There are windows on east and south and one off our back porch. The room/rooms/combo is one of the most pleasant, in our home. We had a lot to do with the design of our home. We asked for the window arrangement, in this room. We also asked for and got an extra extension for the breakfast room area, to fit our 9 ft farmhouse table. My goodness, look at all those windows! Just beautiful. A very thoughtful post (and a necessary read before designing a home). My philosophy is, the more light the better - it makes such a difference in my mood an the mood of the house. I have always wished for more light in my home. Especially from two sides. What a difference that would make! Wishful thinking...I love the diningroom with the blue curtains. Gorgeous.